“You’ve got to stop the movement from the popcorn to the mouth,” Marlon Brando says, speaking of the peak of movie acting. “You’ve got to get them to stop chewing.” At his best, Brando could do that. He was a movie actor for who was serially iconic and yet paradoxically detailed in his performances. From Stanley Kowalski in A Streetcar Named Desired (1951) to Colonel Kurtz in Apocalypse Now (1979), Brando was capable of intense performances that bursts the bounds of the specific film and entered into the culture. A student of Stella Adler and a key exponent of the Stanislavski’s method acting, Brando would also be criticised from unprofessionalism, laziness and egoistic excess, caught between an urge to perfect his art and yet barely able to contain his insecurity and the disdain he frequently held for the movie business. 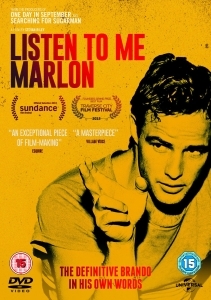 Stevan Riley’s Listen to me Marlon (2015) is an original and fascinating insight into one of the great acting talents of the 20th century. Utilising private tapes which Brando recorded as diaries, memoirs and memos, as well as a tranche dedicated to self-hypnosis, Riley delves into the actor’s life and psyche with an almost disturbing intimacy as we hear the actor ruminating on his career, on his craft and his thoughts, essentially eaves-dropping on the great man talking to himself. We hear of Brando’s troubled childhood, his beloved mother, a neglectful alcoholic, and his father, an abusive salesman and also a drinker. There’s an awkward interview with the father and son together and we see instantly the discomfort as the father is asked of whether he is proud of his son. “I could lick this guy with one hand behind my back,” Marlon ‘jokes’. Although an intensely private man, Brando was also someone well aware of his own legend and ready to burnish it and exploit it to his own ends. Similar ruminations of his childhood can be found in Brando’s bestselling 1994 autobiography Songs My Mother Taught Me and though he was to contradict many of his colleagues and collaborators, Riley prefers to keep his focus strictly on Brando. More interested in retreating to his private island and his heart-felt activism in the civil rights movement, from the fishing and land rights protests of Native American groups to his championing of the Black Panthers, Brando’s career began to suffer from indifferent material with the Terry Southern-inspired romp Candy (1968) held up as the nadir. His resurrection via The Godfather (1972), Last Tango in Paris (1972) and Apocalypse Now provided Brando with continued relevance and also saw him usher in the next generation which he had done so much to inspire: Robert De Niro, Al Pacino and later Johnny Depp. But it’s Kurtz’s voice that the documentary itself seems most aligned with. The slightly meandering but always riveting train of thought and speculation as Brando must deal with great personal tragedy and see the ruins of his happiness around him. With Listen to Me Marlon, Riley has produced not so much a portrait as revealing a self-portrait of one of the most burning, charismatic and intelligent talents ever to grace celluloid.